Leveling lasers are used in different fields for a variety of reasons. The main areas where you will find leveling lasers are land surveying, construction, and agriculture. A leveling laser is a tool that generally has a projector and a beam that can be either put on the ground or fixed to a pole or a tripod. This is a tool that is used to create accuracy and straight angles. The laser will project a straight green or red beam. Leveling tools have been used since the 1600s, and beam lasers have made leveling much more efficient and easy. Leveling lasers are used in agriculture in order to create level ground for farming. When the ground is level, the irrigation system can be more efficient and chemicals and fertilization can be evenly distributed. When a field is not level, there are spots that may not receive a sufficient amount of water. Apart from that, when a field is uneven, certain areas of the crop can lack proper nutrients and pesticides. When there are too many low spots in a field, water can be easily dissolved, and there may be an abundance of nutrients and chemicals in that area. This is something that will change the aeration of the soil and the water uptake of the crop. On the other hand, when a crop field is even and uniform, crop yield will also increases. Leveling lasers are used in every facet of construction. 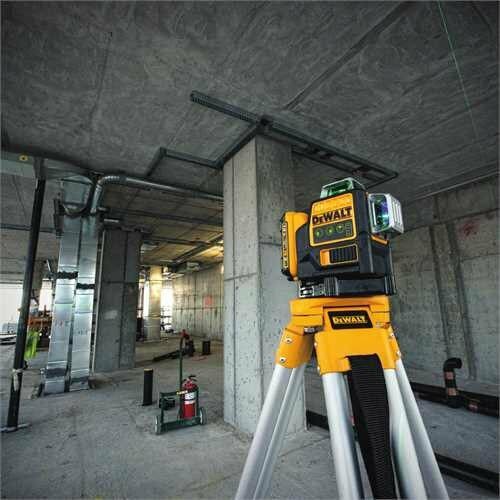 From ground surveying, to hanging pictures, the best laser levels are extremely useful and they are imperative tools in the construction industry. Without levels, not only would structures be uneven, but there would be serious issues with plumbing, tubing, and electrical systems. When it comes to laser levels, the two main companies that are in the forefront of the industry are Dewalt and Bosch. The following is a review of four different laser levels that are produced by these two companies. The DEWALT DW089K Self-Leveling 3-Beam Line Laser is a self leveling laser with three beams. This is a leveling laser that is perfect for commercial and residential use. This leveling laser has a second plumb line that has a 90° crossing. This crossing can be on the ceiling or on the floor. This beam has a track clearance of over 1–3/4 inches. Apart from that, this laser level has a precision of 1/8 of an inch at 30 feet. 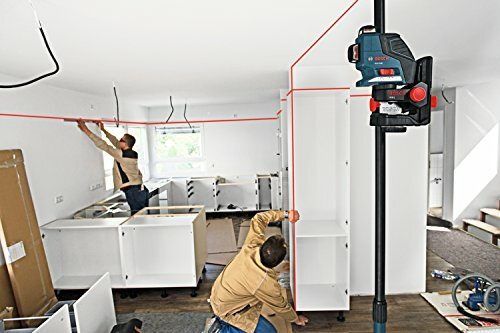 When it comes to precision and ease, this laser level is perfect. It has a micro adjust knob for an efficient alignment. This allows you to adjust the 90° layout lines little by little. You will not have to touch the laser to get the perfect mark. In order to be able to perfectly see the projected lines, this laser has extra bright beam lights. Each beam has its own individual button on the side of the laser, and the beam has its own hard sided transport case. 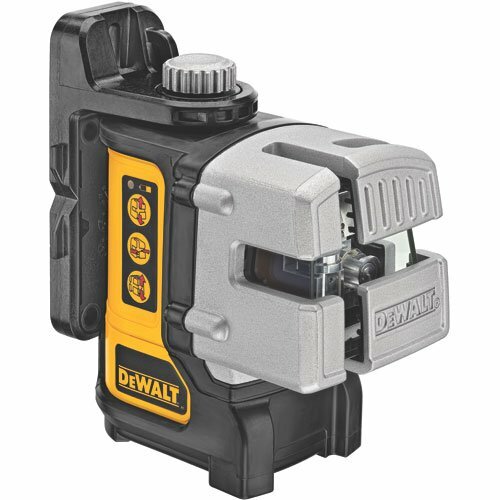 The DEWALT DW089K Self-Leveling 3-Beam Line Laser is great to use with a large rotary and its battery life is amazing. The case that comes with this laser is great, and the case leaves enough room for spare batteries. This leveling laser is extremely easy and fast to set up; you can set up this laser in less than three minutes. 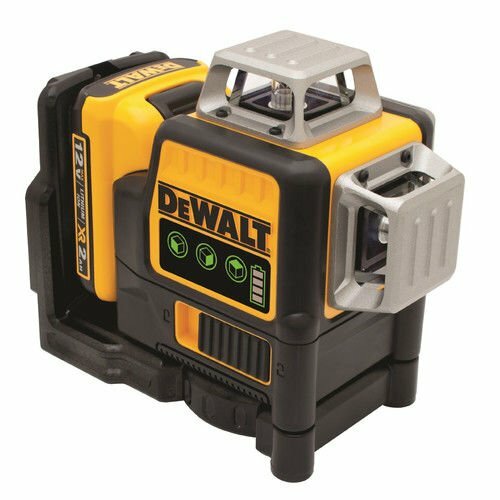 Unfortunately, the DEWALT DW089K Self-Leveling 3-Beam Line Laser does not have a pendulum lock like several other lasers. That means that you have to take extra care with the laser when it is in the case. If you are trying to attach the laser to a story pole, you will find it to be an extremely difficult task. Apart from that, the batteries do not have their own charger, so it can be an annoyance when the batteries loose their charge unexpectedly. The 90° laser is not covered by rubber. Because of this, the glass on the laser can be easily broken. The The DEWALT DW089LG 12V MAX 3 X 360 Line Laser is a nice leveling laser for different projects. This laser has bright green horizontal and vertical lines that it projects. This is a beam that is four times brighter than most laser lights. This allows for better interior and exterior visibility. This laser leveler has a magnetic bracket with 1/4 inch and 5/8 inch thread. This laser is also mold, water, and debris resistant. 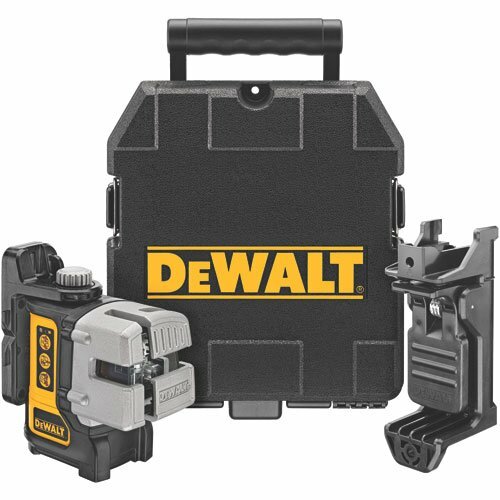 The DEWALT DW089LG 12V MAX 3 X 360 Line Laser also has a 12 volt battery which has an extended running time. Apart from that, the battery is easily rechargeable. This leveling laser does not time out or shut off like other lasers. Apart from that, the battery is rechargeable. This helps you to avoid an expense, and it means that you do not have to leave the job site in order to get more batteries when yours run low. The switch on the level serves to lock the pendulum, and it has an extremely strong magnetic base. This line laser does not perfectly hold a level. Users have complained of issues with accuracy when it comes to the laser lines. Apart from that, micro adjustments for elevation can be difficult because of the poor quality tripod that does not hold up. Even though this level does come with a battery charger, Some users have complained of issues with the battery charger. This leveling laser has great precision and accuracy, and it has a large range of laser measures. These laser measures include rotary lasers and digital levels. This leveling laser has a bright red laser that can deliver easily seen layout lines. This is a leveling laser that is also self leveling. Within this laser, there is a pendulum that helps the laser to stay level by using a self- measuring metric system. This level has great leveling capabilities without a rotating motor. The innovative technology in this laser uses less moving parts, so it is simple to calibrate, and it is compact and light. There are three different 360° planes that can be used with this laser. This laser is perfect for shelves, pipes, cabinets, doors and windows. This laser offers a three plane laser. It also has two 360° vertical planes. Since the laser is self-leveling, it does not require a plum bob. 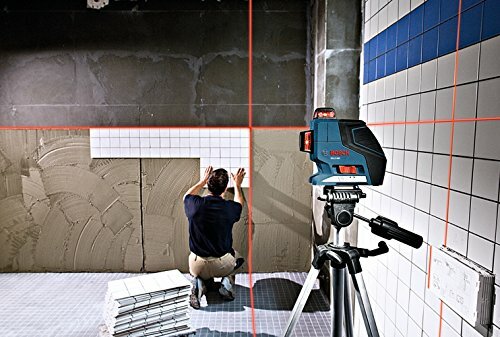 With the Bosch 360 Degree Three Plane Leveling Alignment Laser GLL 3-80 you are able to align, square, and angle. Since the laser is set to one reference mark, it will beam out to 90° layout lines from that reference point. The precision that is found in this leveling beam is remarkable. If the system realizes that the self leveler is off kilter, it will lock itself in position and turn the switch off so that accuracy is not compromised. This is a laser leveler that is extremely easy to use; it only requires you to tap one button to start. This level has a safe transport lock that safeguards the pendulum when the laser is not on. Apart from that, mounting is simple and it is easy to set up. The blank can be difficult to recalibrate. Apart from that users have complained about the brightness of the laser. Since the laser is not as bright as others, it can be difficult to see light areas. Apart from that, there is no way to shut off the laser that are not in use. These laser shoot off around the room and they can be annoying. The Bosch Three Plane 360 Degree Leveling and Alignment Laser with Line Laser Receiver GLL 3-80 LR2 is a self leveling laser. This level has one 360 degree horizontal plane and two 360 degree vertical planes. Since this laser level is self leveling, it has a system that allows the pendulum to align the laser if the lasers become off kilter, the smart system in this laser will lock the laser and switch it off. This is a light-weight level laser that allows you to extend the alignment by up to 265 feet. This level is easy to set up, and it is simple to transport. 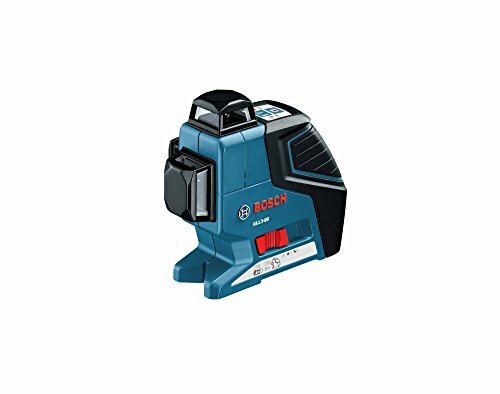 The Bosch Three Plane 360 Degree Leveling and Alignment Laser with Line Laser Receiver GLL 3-80 LR2 also has two transport locks that will guard the pendulum when the laser is not in use. This laser includes the LR2 line laser receiver, the LR2 assist, and a hard carrying case. With the self leveling system that comes with the level, the level will place itself at the appropriate height, and it will indicate when the level is out of alignment. This laser is perfect for marking and leveling in and outdoors. It gives a range of up to 65 feet and you can increase the amount of alignment that you have with this leveling laser. If you are working in bright conditions, the receiver on this lever will locate the lines for you so that you can easily finish your job. The set up for this laser is quick and simple, and the carrying case is the perfect size for you to transport the laser. When it comes to the cons, there have been some individuals who have used this laser and have stated that the laser beam is too light. They indicate that it is difficult to see the laser when working in outside conditions. Whether you are an individual who is interested in purchasing a leveling laser for work or for personal needs, it is a wise move to investigate and see which laser is going to best fit your desires. Leveling lasers have a huge range when it comes to price, and you have great options at your disposal. Once you review this article and pinpoint a leveling laser that you think has the features that you like the most, you can see if it is a laser that will be worth purchasing.